I have listed a new property at 708 2228 BROADWAY W in Vancouver. "THE VINE" This is the best 1 bedroom and den in the building. 7th floor overlooking the courtyard. Away from Broadway with views of the water, freighters mountains and over top of Kits. Super convenient to shopping, transportation,the best restaurants and recreation for your Westside lifestyle. Big open plan rooms, south west facing balcony, walnut engineered floors, Granite countertops, stainless steel appliances, kitchen island, insuite laundry and a large usable den space. Bright, Fun and in the heart of it all. YOU'LL LOVE IT! The Real Estate Board of Greater Vancouver (REBGV) reports that total sales of detached, attached and apartment properties in 2012 reached 25,032, a 22.7 percent decline from the 32,387 sales recorded in 2011, and an 18.2 percent decrease from the 30,595 residential sales in 2010. Last year’s home sale total was 25.7 percent below the ten-year average for annual Multiple Listing Service® (MLS®) sales in the region. The number of residential properties listed for sale on the MLS® in Greater Vancouver declined 2 percent in 2012 to 58,379 compared to the 59,539 properties listed in 2011. Looking back further, last year’s total represents a 0.6 percent increase compared to the 58,009 residential properties listed in 2010. Last year’s listing total was 6.1 percent above the ten-year average for annual MLS® property listings in the region. Residential property sales in Greater Vancouver totalled 1,142 in December 2012, a decrease of 31.1 percent from the 1,658 sales recorded in December 2011 and a 32.3 percent decline compared to November 2012 when 1,686 home sales occurred. Since reaching a peak in May of $625,100, the MLS® Home Price Index composite benchmark price for all residential properties in Greater Vancouver has declined 5.8 percent to $590,800. This represents a 2.3 percent decline when compared to this time last year. 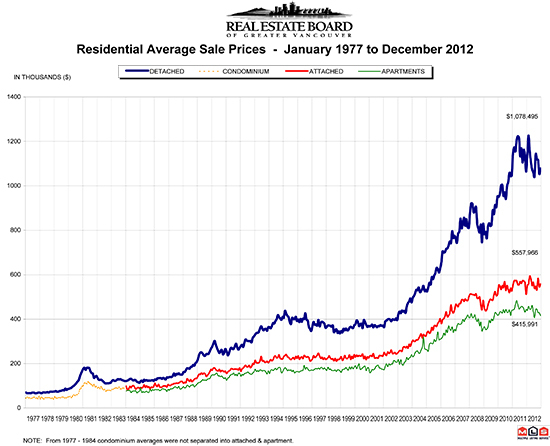 New listings for detached, attached and apartment properties in Greater Vancouver totalled 1,380 in December 2012. This represents a 15.3 percent decline compared to the 1,629 units listed in December 2011 and a 50 percent decline compared to November 2012 when 2,758 properties were listed. Sales of detached properties in December 2012 reached 425, a decrease of 32.5 percent from the 630 detached sales recorded in December 2011, and a 44.7 percent decrease from the 769 units sold in December 2010. The benchmark price for detached properties decreased 2.7 percent from December 2011 to $904,200. Since reaching a peak in May, the benchmark price of a detached property has declined 6.5 percent. Sales of apartment properties reached 504 in December 2012, a decline of 34.9 percent compared to the 774 sales in December 2011, and a decrease of 37.9 percent compared to the 811 sales in December 2010.The benchmark price of an apartment property decreased 1.9 percent from December 2011 to $361,200. Since reaching a peak in May, the benchmark price of an apartment property has declined 12.8 percent. Attached property sales in December 2012 totalled 213, a decline of 16.1 percent compared to the 254 sales in December 2011, and a 33.2 percent decrease from the 319 attached properties sold in December 2010. The benchmark price of an attached unit decreased 2.6 percent between December 2011 and 2012 to $450,900. Since reaching a peak in April, the benchmark price of an attached property has declined 4.4 percent. I have sold a property at 3585 31ST AVE W in Vancouver.